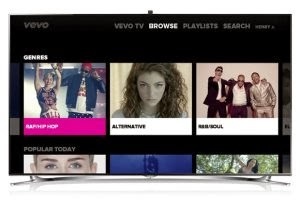 VEVO announced that it is launching on yet another connected TV platform today, making its music videos now available on the latest Samsung Smart TV products. The launch will grow the number of viewers who will have access to the company’s streaming service, while also improving monetization of its content. Over the past several years, VEVO has moved to make its music video apps ubiquitous across all screens and all connected devices. It started out on mobile devices and tablets but has been gradually expanded to Roku, Apple TV, and the Xbox. As a result, VEVO’s app becoming available on Samsung Smart TVs isn’t that big of a surprise. The app will be made available on Samsung Smart TV products — both actual HDTVs and Blu-Ray players — from 2012 and 2013, and will work in a number of different geographies, including the U.S., Australia, Brazil, Canada, France, Germany, Ireland, Italy, The Netherlands, New Zealand, Poland, Spain, and the U.K. According to the company’s blog post, the Samsung app is built for TV viewers. When launched, it will go directly to the company’s recently launched live VEVO TV interface. VEVO TV is kind of like the next-generation of MTV, built for the streaming video set — it’s a human-programmed group of music videos that runs in a linear feed. From the Samsung TV app, viewers will also be able to browse different genres of music videos to get a continuous feed of certain types of music. They’ll also be able to view playlists that they’ve put together once they’ve connected the app to their own individual accounts. For VEVO, the goal is not just to get its 75,000 music videos in all the different places where viewers might see them, but to better monetize those videos on new platforms. Since the company controls all the ad sales and placement on new connected TV platforms, it gets more money than for videos that appear on, say, YouTube. While YouTube is still the biggest single distribution platform for VEVO, more of its revenue is coming from new platforms and from original content. Expect VEVO to try to take advantage of this as it expands to even more online and connected devices as time goes on.